You make care plans for patients and plans for your family and for meals and appointments and vacations and…; what about making a self-care plan for you? The hectic life of working long hours being in demand throughout the day and again outside of work can lead you to feeling lost in the shuffle. Creating a Care Plan for you, one that you can implement on a weekly basis can go a long way to reconnecting with yourself and reinvigorating you. Recently, I was inspired by an article published by Mindful. It was a good reminder of the importance of checking in with yourself to identify what you need to thrive. 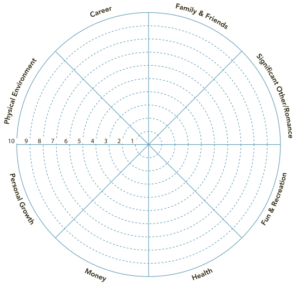 What follows focuses on how you can develop a Care Plan for you. Use the wheel of life below; it identifies 8 components of your life. While each is discreet, they all impact one another. The center represents 0 – no satisfaction and the rim represents a 10 – ecstatically happy with this aspect of your life. For each pie wedge, life component, how satisfied are you? With your greater awareness, start to think about ways to improve your satisfaction in an area that is important to you now. This is the beginning of your care plan. Just like with patient care, you need to think about the desired end points, short and long-term goals, and how to reach them. What are the activities and resources that are necessary? In creating your care plan, you may want to review some of the questions below with a close friend or coach. Choose someone who has and expansive view for you and wants you to enjoy and thrive. Focus on one component of the pie and ask yourself, “What would make me more satisfied here?” make a list of ideas that come to you. Keep going “What do I choose to do?” Remember this is a weekly plan, so how often will you engage in this activity? What resources do you need to make it happen? Recall the benefits of making this choice. What will it feel like when you do the activity? Even if it is conscious breathing or a bath. Think about the benefits in the moment and for you as a person. Now the rubber hits the road, you commit and take action. Your self-care plan will allow you to reconnect with yourself and identify needs you may have overlooked. Having a ready-made plan makes it easier to achieve your goal of greater satisfaction. The plan helps you focus and keep moving forward. Sometimes creating and following a plan is overwhelming, many obstacles may pop up. For support in making your unique self-care plan, contact me. If you like this post and know others who may enjoy it, please share. 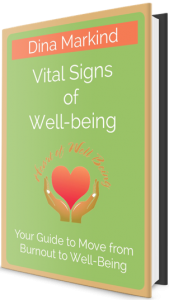 If you’re not yet on my list, please sign up at HeartofWellBeing.com to receive articles twice a month.